Mid-Canterbury farmers have hit out at suspected arson after four fires in crop stubble, hay bales and a shed containing machinery. They are worried a firebug might be on the loose after fires started at 4.30am on Saturday east and west of Tinwald. Federated Farmers Mid-Canterbury grain and seed chairman David Clark said there was a strong suspicion from the way the fires were lit, their location and timing, that arson was involved. He said farmers were appalled by the behaviour. The fires were senseless and had put property at risk and potentially could have put lives at risk. . .
Central Otago fashion designer Christina Perriam’s range of merino clothing for children and babies is proving a hit with New Zealand retailers. Less than a year after its launch, Suprino Bambino has been picked up by 22 child and baby boutiques following a nationwide selling trip and trade fair. There were also plans to market it overseas, with Australia potentially being the first international market. . .
With his hand firmly on his mustering stick, J. J. O’Carroll patiently waited for the start of his 68th consecutive Hawarden Ewe Fair last month. Not only was it Mr O’Carroll’s 68th trip to the saleyards, but it was also the 68th year the O’Carroll family had ewes from their farm, Waitohi Downs, for sale. As the punters filled the races and the auctioneers got ready for a day’s selling at the January 31 ewe fair, Mr O’Carroll leaned against the rail and cast his eye over the sheep. Many things have changed since he started selling ewes in 1946. ”The breeds of sheep are so different now. Sometimes when I look in a pen, I have a hard time knowing what they are. ”Still, it has brought about improvement to the industry,” he said. . . The news is all good for potatoes. The unassuming tuber has been not only named New Zealand’s top vegetable but has also been singled out by ANZ economists as an ”unappreciated” or unacknowledged” sector to watch. In this month’s ANZ Agri Focus its economists have written about several ”themes” they consider will influence the economy through 2014 and beyond. Among the several ”unacknowledged legs of the New Zealand Story” which they say have the potential to contribute to and underpin the New Zealand growth story is the potato sector. 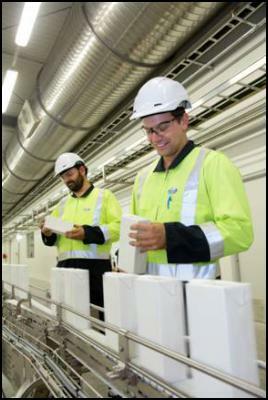 . .
Fonterra employees Te Ngahau Bates (left) and Eddie West (right) monitor an Anchor UHT processing line at the Co-operative’s new $120 million UHT milk processing site at Waitoa. The white packs contain water which was run through the site’s processing lines. The stainless steel is shining and the last bolts are being tightened at Fonterra’s new $120 million UHT milk processing site at Waitoa. After more than 12 months of construction, the site is on-track to produce its first Anchor UHT product off the line in March. UHT Operations Manager, Donald Lumsden, said the Co-operative couldn’t be more excited. “This is a very exciting time for Fonterra. The global demand for dairy is growing and we’re now well-positioned to meet this growth with our new state-of-the-art UHT milk processing site at Waitoa. The site will enable us to optimise the milk our farmers produce by turning it into high-value consumer products that will meet market demand in Asia.” . . .
A forecast 15% increase in earnings from primary sector exports to June 30 this year is a huge boon for the Maori agri-business sector, the Federation of Maori Authorities says. The Ministry of Primary Industries announced this week that based on trends it believed there would be an additional $4.9 billion in earnings from agriculture, forestry and fishing exports in the year to June 30, based primarily on intensifying demand for dairy products, meat, pelts, wool, wood and seafood from China. The revised annual forecast is now $36.4 billion. “That’s great news for Maori producers,” Federation of Maori Authorities’ CEO TeHoripo Karaitiana said. “They can now count on banking a lot more this year, and having a lot more financial discretion in their planning for the next few years.” . . .